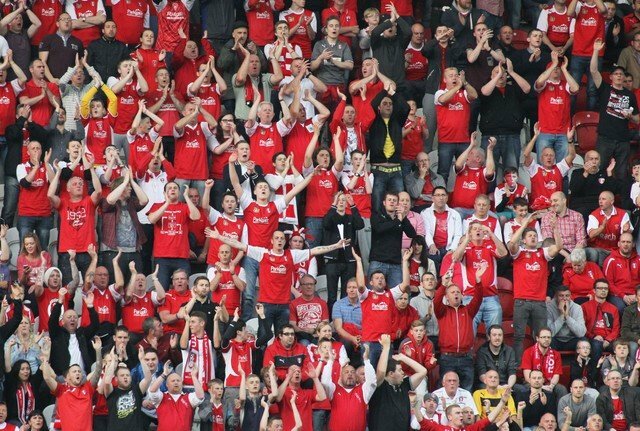 Rotherham United Manager Paul Warne says that the sight of fans queuing round the New York Staduim on Wednesday morning for tickets for the away leg of the play-offs was ‘amazing’. ‘Even I’ve had to buy tickets for this game,’ the Millers Boss told iFOLLOW, ‘and that’s unheard of. Luckily I didn’t have to queue up. ‘It’s some effort but we obviously know we’ve got some good fans here. ‘We have a good away following and anyone who is prepared to queue up from six o’clock in the morning to get to the game I hope will sing their hearts out because it does make a massive difference. ‘Most of our great performances away from home this season has been when there’s been a good following. ‘The fans have been great and we’re really proud of the connection the players have got with the fans this year and I hope they can perform to a level to make them proud again.